Home > Video > Janet Yellen Are We In A Bubble? 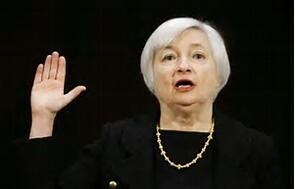 Janet Yellen Are We In A Bubble? We look at exorbitant P/E Ratios across the stock market where I literally can pull any stock up and find an insane p/e ratio right now, and secondly the economic data doesn`t justify a 65 basis points effective fed funds rate. Yes we are in the biggest stock market bubble of all time Janet Yellen!